The Farmer and I aspired for a simple life long before we actually tried to live it. Separately, we had each spent too many years and too many dollars pursuing a misguided version of the American Dream. It was a path that was all about achievement, consumption, debt, and more consumption. We wanted off that merry go round and when we married we determined to modify our lifestyle to suit our income. Frankly, the income was minimal. A Too Expensive Mortgage Heavy Home was sold and a modest farm was purchased in its stead. We longed for a quiet, purposeful Farm-based existence and had a somewhat naive vision of what that would entail ...animals frolicking in green pastures, fields bursting with organic vegetables, a tidy little farmhouse, and the two of us whiling away time rocking on the porch. Umm.....Not exactly! Although there are frolicking animals, pretty fields, and many quiet, pastoral moments, sometimes it seems more like Mud and Mayhem! Hurry Farmer! There is more work to do! We have found that the path to simple is surprisingly complicated, and at times, a bit scary. There is always more month than money and too few hours in the day. 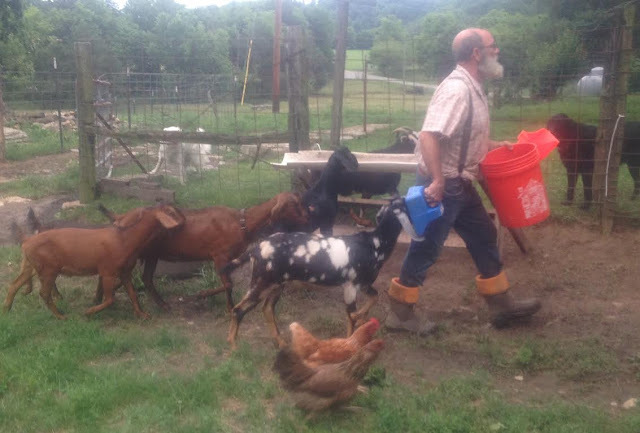 We are new to this whole Homesteading Thing and a misstep can have serious consequences. Fortunately we have been blessed to have developed wonderful friendships in the Amish and Plain communities in our area. They are quick to offer practical advice, from which wood stove to buy, to how to doctor a sick hog, to how to use jewel weed to combat poison ivy, and beyond! The little hardships are made easier by the sense of community as well as my end of day glass of wine and porch time! The men enjoy talking farming! Anywhooo...The Farmer and I have been in the market for a Jersey cow and when we found out that there would be several Jerseys up for auction in a nearby Amish community, we made plans to attend. Farm auctions are always a lot of fun and provide us with an opportunity to connect with farming friends that we do not often see. A tiny puppy makes Friends of Strangers at a recent Community Auction. We got to the auction late...just after the Jersey Cows had been auctioned...much to the amusement of our friends. Fortunately, one of them knew somebody who knew somebody and our new Jersey will be delivered tomorrow afternoon. She is at least 10 years old but The Farmer and I think her maturity might work in our favor. Although we have over forty dairy goats, we have never milked a cow. We are hoping that SHE will train US. Regardless, it is going to be an adventure! 2 cups of neutral oil, for frying. First, cut the florets from the Cauliflower and toss them into a pot of boiling water and simmer for 15 minutes or so, until the Cauliflower is very soft. While the Cauliflower is simmering, prepare the other veggies. Chop the onion in a 1/4 inch dice and do the same with the Red Pepper, discarding the seeds before dicing. Chop the herbs. Shred the zucchini, skin and all. I use one of my all time favorite kitchen tools for this purpose--the Kiwi Pro Slice Peeler. I got mine at Bangkok Market, a specialty grocery store in Nashville. The slicer helps make food look pretty! When the cauliflower is finished, drain it in a colander and let it cool for a bit. Whisk the eggs in a large bowl and add the Cauliflower, using a spoon to smash it into small pieces. Toss in all of the other ingredients and mix well. Next it is time to sautee the fritters! Heat about an inch of oil in a large skillet over high heat. You will want the oil to be quite hot. I use an ice cream scoop to spoon out the cauliflower mixture to ensure even sizing, but a 1/4 cup measuring cup would work equally well. Do not crowd the pan and watch the heat carefully. It should take 3 - 4 minutes to cook each side through. If the fritters are cooking too quickly, simply adjust the heat. Don't try to flip them early as you will be dealing with a gloppy mess. The fritters firm up as they cook and when they are ready to be turned it will be easy to do. Put a paper towel under a wire cookie rack and put the cooked fritters on the rack to drain. I find that putting them directly on paper towel serves to steam the fritters, softening the crunch. The rack avoid those issues and allows any extra oil to drain off. The fritters can be frozen and reheated in the oven. 350 degrees for 15-20 minutes will crisp them right up. I top them with Tzaziki Sauce made from our Farm Goat Yogurt. A bread recipe that will make you swoon and a guest Post from The Farmer! YUM! Pat, love the recipe! Thank you for sharing a glimpse of the daily farming life. Thanks, Amy! It isn't Gluten Free as written but Rice Flour (or any other GF Flour) would be a great substitute! Pat, I love hearing about your life on the farm and about the farm animals!! It makes me smile on days I have little to smile about! (Of course my furbabies make me smile too!). Don't stop posting!!! Thanks, Ally! I am milking our now cow for the first time this morning....hopefully I won't get kicked!